This petition made change with 103 supporters! "So after playing Smash 4 for the past few days, and feeling how it is, I began to notice peculiar trends in how knockback is determined. After doing some investigative work, I've successfully determined what's going on and proven it. Before I explain that, though, I would like to explain the mechanic Directional Influence as it appeared in past Smash titles for those who are unaware. In previous Smash games, Directional Influence is a HUGE factor to not only high/top level play, but even mid-level play. Unlike other competitive fighters where combo & punishment mitigation is nearly non-existent or limited to resource-based mechanics or RPS techs, Smash games (specifically, Melee and Brawl, as well as Project M as a result) give the combo'd player an option to mitigate their punishment and interact with their opponent despite being in stun. By holding a direction by the time a move sends you flying, a player is able to influence the direction they're being sent. Note that the key word here is influence; a player is unable to add or subtract knockback, only change the trajectory angle. Depending on the game this generally allows you to change the launching trajectory of the attack you're hit with by +/- 18 degrees. Now that you understand all of that, throw it all out the window for Smash 4. Instead of DI, a different mechanic is present. To the untrained eye it may seem similar, but it in fact works in an extremely different way that drastically changes how we decide which direction to hold when we take a hit. To explain this mechanic properly, I need to first explain what happens when a character is hit. So what's happening when you get hit? When you get hit, you receive knockback. This is a raw value calculated based on percent, weight, the knockback values of the move, and the damage/staling of the move, and then your character moves that many in-game units per frame. There's a constant in the game that subtracts from that speed, so you are going X units/frame on frame 1 and then (x-constant*frame#) units/frame on subsequent frames. Other factors take place such as a character's falling speed acceleration and such, but that's the general idea. Physics is fun! In Smash 4, by holding a direction on the control stick (or circle pad in our case), you're able to add a vector of units/frame to your knockback when launched. A simple explanation of a vector in this context is a value of units/frame as well as a direction. I believe this vector's strength is a percentage of the knockback you're suffering, so it's less powerful at low percents/when hit by weak attacks and more powerful at higher percents/when hit by powerful attacks. The use of this mechanic, I will call Vectoring. It's called such because it allows you to make a vector additional to knockback (functioning independently) in any direction you'd like. Please note that referring to this mechanic as Directional Influence is not only incorrect, but misleading and can easily cause confusion. Unlike most other series, our community keeps playing games competitively after sequels are released, so it's important to not conflict with prior terminology when describing different phenomena. The problem with calling it DI, and saying it influences your trajectory, is that you can Vector parallel to the initial trajectory. "DIing" an upwards-sending move down doesn't change your trajectory, and as such DI is a poor name for it. The best way to describe the mechanic without confusion is to, as I have, explain that it allows you to add an additional vector to your flight path, that doesn't necessarily alter trajectory. Thus, vectoring is what we should use unless Nintendo gives an official name. 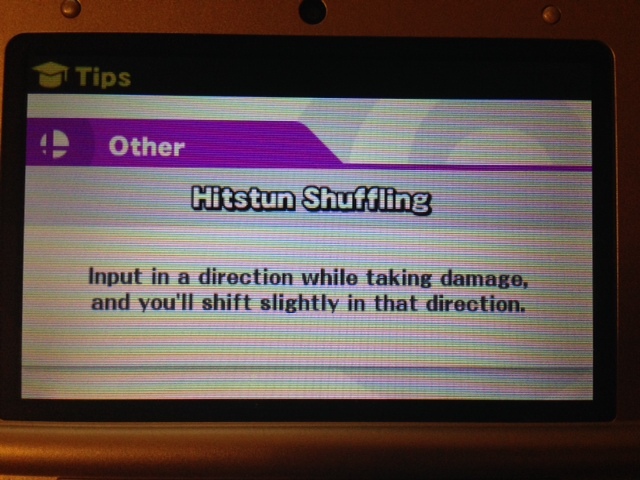 (Hitstun Shuffling seems to describe SDI, not Vectoring). For explanation purposes, let's assume the percentage of this is 20%. You are hit by an Upsmash whose knockback value at your current percentage is 100. For simplicity's sake, the trajectory of this attack is 90 degrees, straight upward. You are holding down, which grants you a vector downwards of 20 (units per frame, I'm just going to use numbers from now on). When these vectors are added, the resultant knockback vector you suffer is 80 and upwards. Similar is true for if you were to hold up in this situation; the resultant vector would be 120, which would cause you to die at an earlier percent than if you hadn't held anything. This has huge applications for survival as well as combo escapes. So basically, you get to go a further or shorter distance, or add some adjacent distance to your flight path, but you do not suffer additional/reduced hitstun. It's basically like having a mega Automatic Smash DI that scales with KB. Unlike in other smash games, the resultant vector's vertical component is not any lower, and as such you will not survive at any later percent than you otherwise would. I don't have the means to describe this vector in ASCII, but it's a vector whose vertical component is 100 and horizontal component is 20. To reiterate, this percentage value in these examples is most likely not the actual value and is only a value used for explanation purposes. In fact, there may be a formula at play to determine how strong it is that scales exponentially, linearly, or otherwise, rather than a simple percentage. I have literally no idea. You might be thinking to yourself, "An interesting theory, Strong Bad. But I'm pretty sure people have been talking about 'Down DI' for a couple days now, which reduces knockback of all attacks regardless of trajectory by simply holding down. Why should I believe your 'Vectoring' over 'Down DI'?" A fair question, that has a fair answer. It's simple; I have tested KO percents while holding various directions on the circle pad and found them to support my theory. For these tests, the attacker SD'd between tests to ensure moves were fresh, and the victim performed a long-lasting taunt to ensure the victim didn't walk, jump, or crouch before impact. A quick impromptu demonstration of this technique is showcased. Would rather have a better vid but whatever. Holding down against vertical attacks, as explained earlier, does indeed cause you to survive for longer. The test for this I did was with Game & Watch's fully charged UpSmash against Jigglypuff on FD. With no control stick direction, Jigglypuff dies at 47% (before the hit of course). Interestingly enough and contrary to our prior perceptions of Directional Influence, when holding either left or right, Jigglypuff still dies at 47%, even though she clearly is sent to the left or right and not straight up. Holding down, however, allowed Jigglypuff to survive even when struck at 51%. Later testing found downward-vectoring to allow Jigglypuff to survive at 52% as well, and die at 53%. However, against horizontally sending attacks, holding down either does not change your kill percentage or actually makes you die earlier. Testing this has been fickle, as anyone well versed in Smash mechanics is aware that "horizotally sending moves" actually send at a trajectory closer to ~45 degrees diagonally upwards, and a character's falling speed acceleration attribute (commonly known as gravity) acts simultaneously with knockback trajectory to make it appear to be more horizontal. But I can confirm that what I said earlier is true, as I have tested this with a fully charged Bowser Fsmash against Jigglypuff at the ledge of FD. Given the same percentage (14% in my tests), Jigglypuff died whether I was holding down or not at all. And as expected given the previous explanation, holding toward the stage resulted in Jigglypuff not dying. These tests were conclusive; the mechanic in place in Smash 4 is as I described it above, and does not function similarly at all to Directional Influence. Jigglypuff dying at the same percent even when vectoring horizontally confirms this. In conclusion, this is absolutely one of the biggest mechanical changes in Smash 4 in the context of competitive play. Throws that would normally combo well into the 80s against many characters such as Sheik's Dthrow, Rob's Dthrow, etc. become purely positional throws quite early in a stock if you hold upward. Moves that would otherwise kill you off the top, don't. If for some reason you'd like to die earlier off the top, this is the first smash game to allow you to do so. Vectoring properly against horizontal attacks is very similar to how one would DI them in previous smash games, but vectoring properly against vertical attacks is completely different. As explained earlier, trying to "DI" as one would in a previous smash game does literally nothing to help you live." With the newly found mechanic, vectoring is going to promote even more defensive play in Smash Bros 4, which the game already has enough of. Please consider removing this mechanic Nintendo and Sora Ltd. It would be what's best for the metagame of Smash 4. Nick Strickland needs your help with “Nintendo: Patch and remove vectoring in Super Smash Bros for Wii U and 3DS”. Join Nick and 102 supporters today.